Our 2010 Road Trip, Part 4: The Land of Chocolate « Midlife Crisis Crossover! For the years when my son tagged along on our road trips, we tried to include a few kid-friendly stops for his sake — often an amusement park, or a zoo, or someplace loaded with sinfully sugary treats. We never expected to find a place that combined all three in some sort of animal snack funtime heaven. 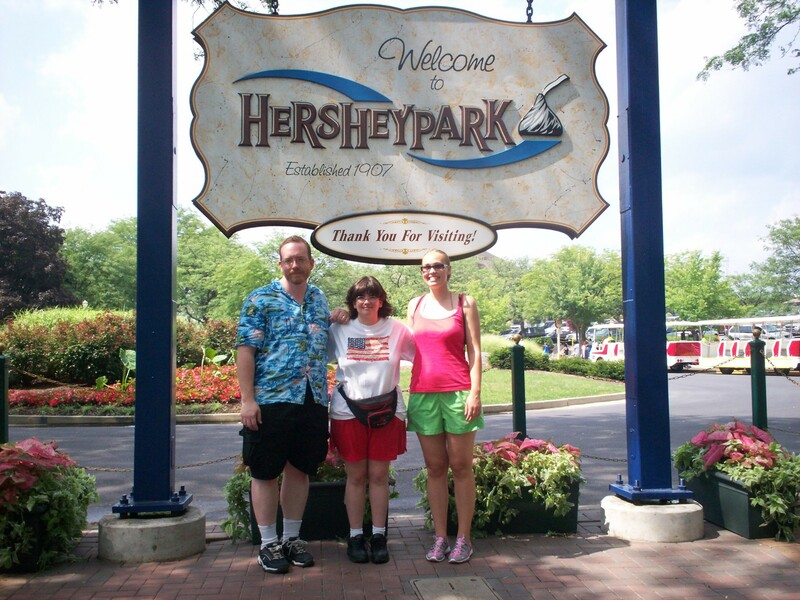 Such was the magic we found in Hershey, Pennsylvania. DAY THREE: Wednesday, July 21st. Our Exton hotel breakfast was free, continental, and slightly less tiny than the previous hotel’s. One novelty this time was the option of self-service microwaveable quiches, bacon-egg-‘n’-cheese biscuits, and pancake-‘n’-sausage-on-a-stick. My quiche was 90% gooey crust. Blargh. An hour’s drive west brought us to the scenic town of Hershey, a very well-kept place thanks to the benevolence of Milton Hershey, the entrepreneurial pioneer whose heroic efforts to introduce America to the amazing wonders of mass-produced milk chocolate paid off tremendous dividends and to this day provide for the upkeep and wellbeing of the surrounding town. Imagine life in a small town where you were surrounded with hints of candy everywhere you turned. Sigh. But first we had to meet our tour guide: another internet friend! As with dinner the night before, Carla was another fellow fan from the same geek message board we’d been frequenting for years. It was our first time meeting in person, and we couldn’t thank her enough for playing fantastic tour guide for a day. Photo by my son, content to be on the other side of the lens. 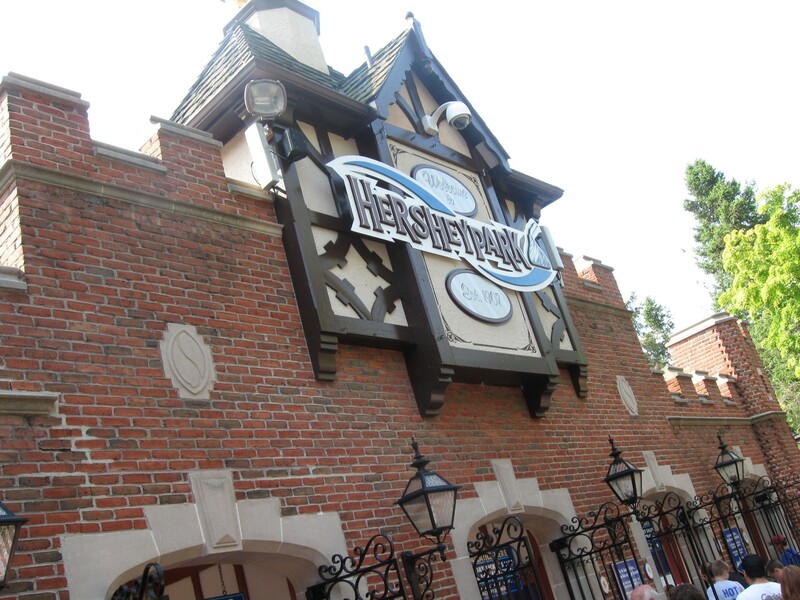 We carpooled to this year’s mandatory theme park, Hersheypark, which bean in 1906 as a non-electric sports park for ballplayers and other physical enthusiasts. 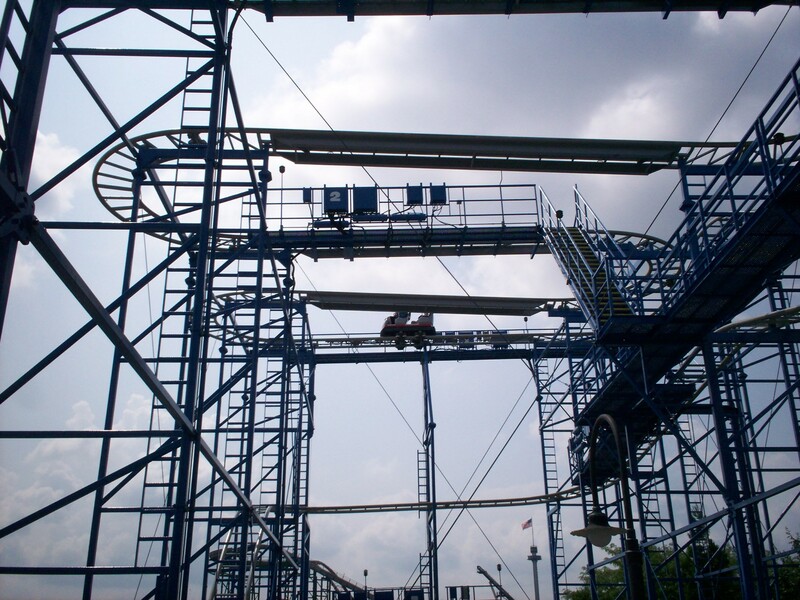 Over the next few years the owners began adding a carnival ride here and there. Before they knew it, the 1920s brought roller coasters and sports faded into the background. 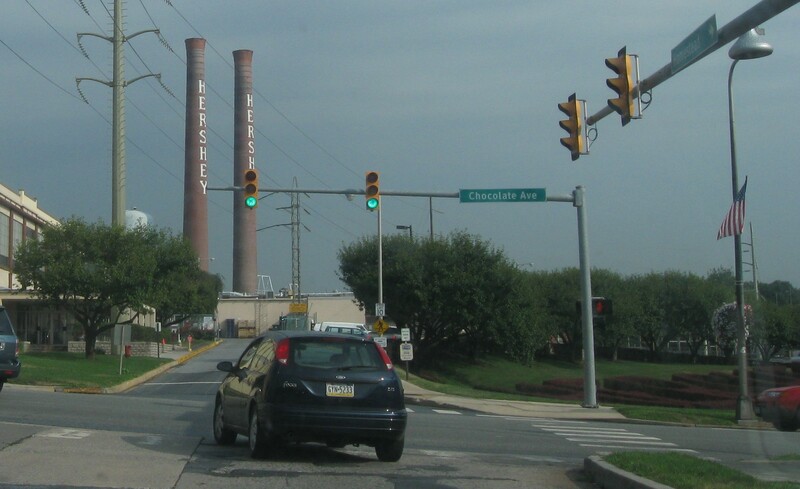 No matter which activities were in the forefront, Milton Hershey, his inheritors, and his chocolate made them possible. This way to adventure and chocolate. 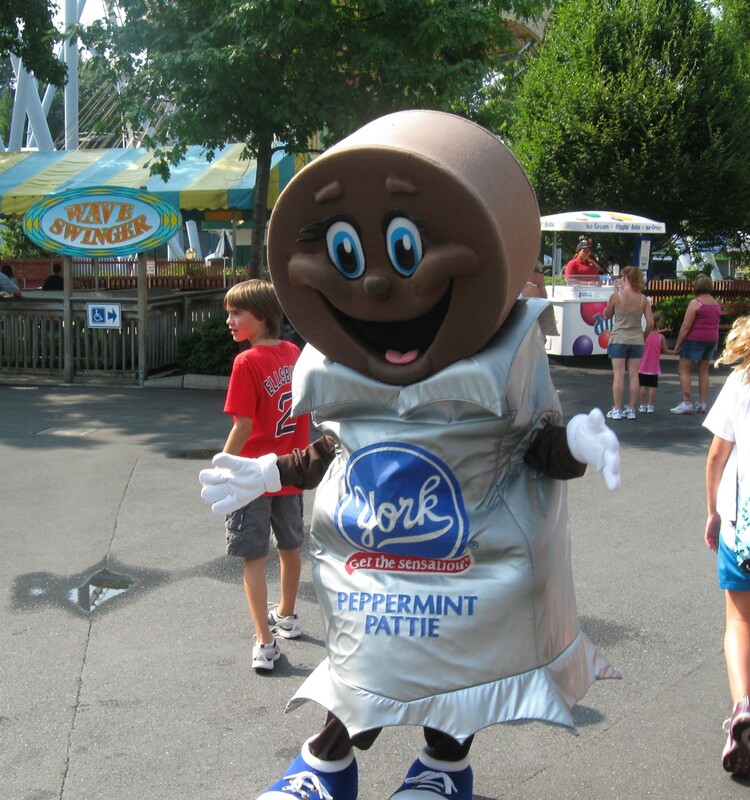 Beyond the chocolate, if we simply must look past it, Hersheypark was a perfectly fine amusement park — among the cleanest we’ve ever seen, with nary an “OUT OF ORDER” sign as far as I recall. Lines weren’t bad early in the day, either. 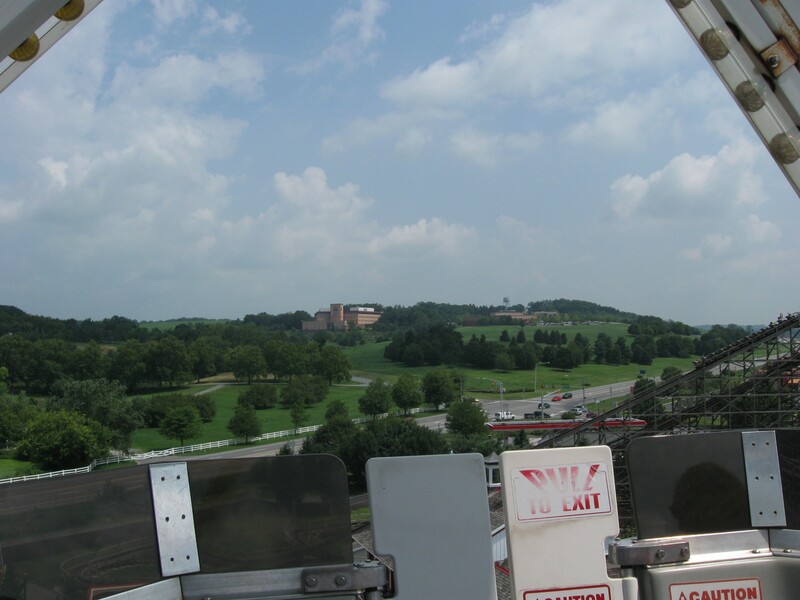 Hersheypark at a glance from the top of the Ferris wheel. Looking back and to the left from the same Ferris wheel, we could see those amazing chocolate factories that bring sweets and world peace to all the good girls and boys. We tried a few rides, of course. 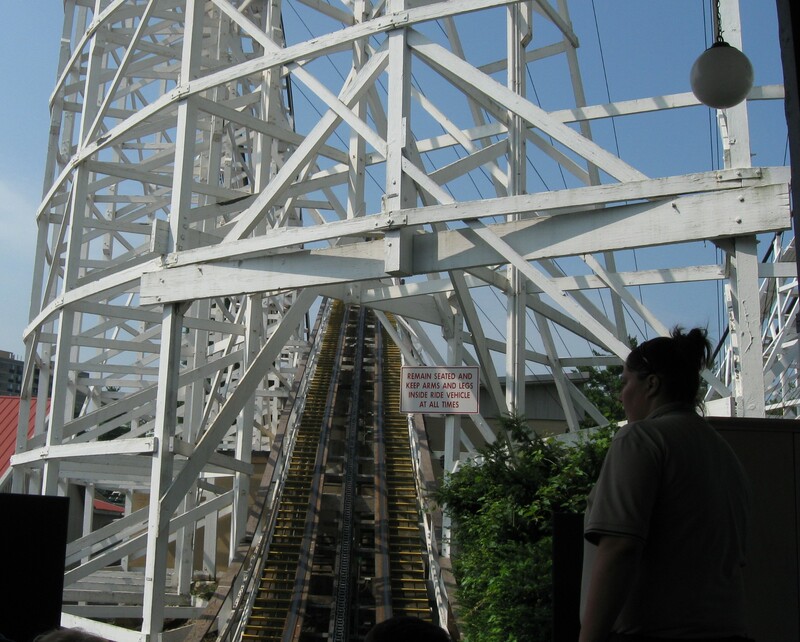 We rode three wooden roller coasters: the Comet, which was adequate; the Wildcat, which was rickety and uncomfortable; and the Lightning Racer, whose entrance is a dead ringer for the Racer at Kings Island in Cincinnati, but whose tracks are less linear and more exciting. The first hill of one such coaster, before takeoff when my vision turned entirely into speed lines. 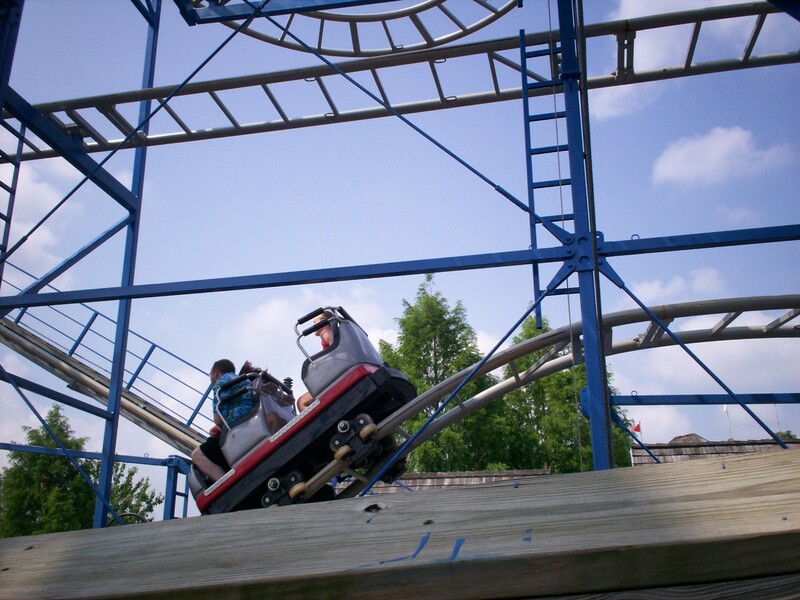 The most exhilarating coaster was the Wild Mouse, whose innocuous name and deceptive appearance didn’t warn us for a ride where the cars felt as though we could tip over at every turn and plunge to a fiery doom a la Final Destination 3. Anne, happy to stay behind and watch everyone’s bags, found it was also rather easy to photograph. The inner workings of the Wild Mouse all around us as we rode. 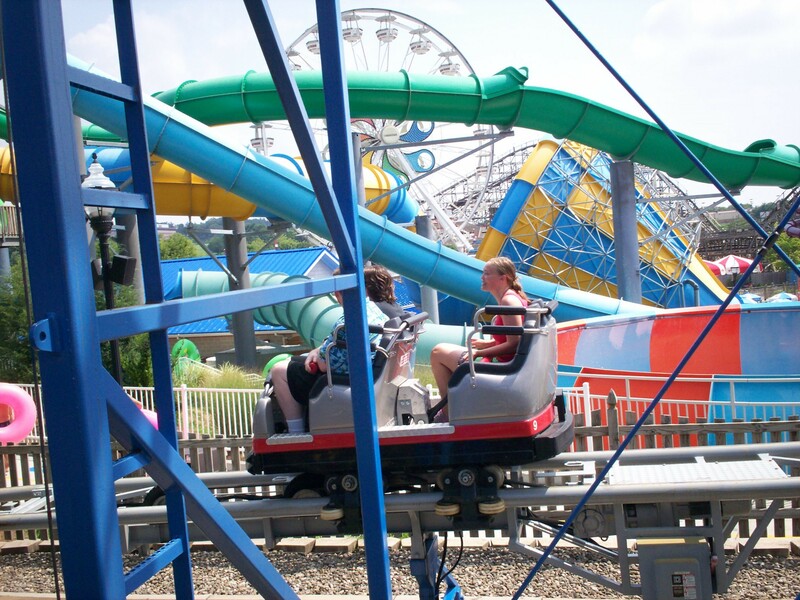 On steel coasters, sharp hills are more fun and less damaging. A moment of calm when the Mouse stopped roaring. * Their sellout bumper cars, renamed the GEICO Fender Bender. Those happy fun collisions you’re about to commit? In real life, GEICO would help pay for them! * The Reese’s Xtreme Cup Challenge, a gentle car ride through a utopia of air conditioning and candy, plus you’re armed with light pistols so you can shoot targets and perpetrate your own smiley-faced candy-coated sci-fi drive-by. * The Tidal Force, one of those whitewater-rapids group innertube things ideal for a swift summer cooldown. 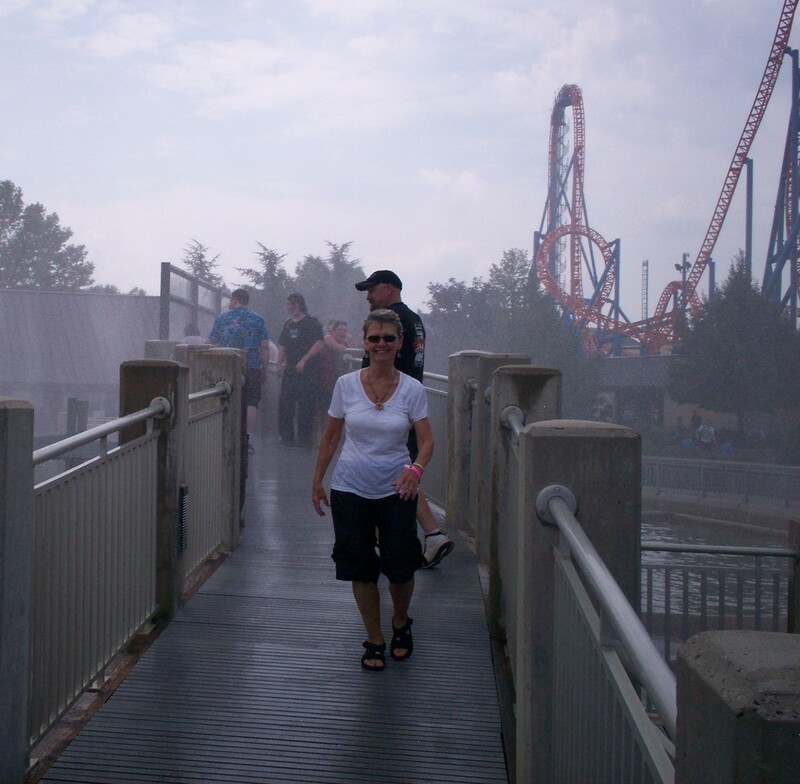 …and a post-ride soaking deck, where my son and I hung out for a few minutes in the mist while Carla and Anne reached minimum safe distance. 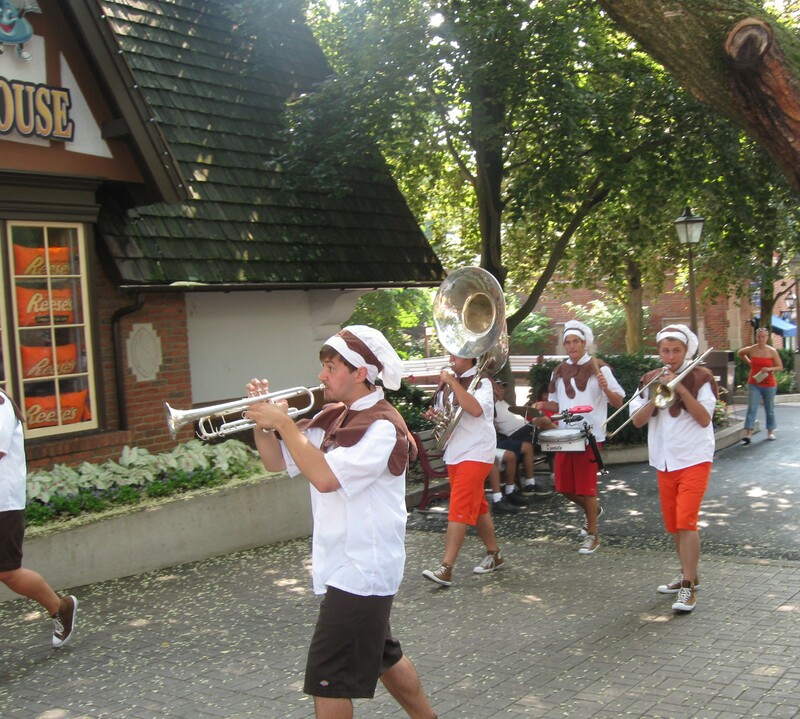 Some parts of Hersheypark were just like any other park. They kept it normal and high-quality, no skimping on amenities. As you can imagine, the treat options ranked well above average. 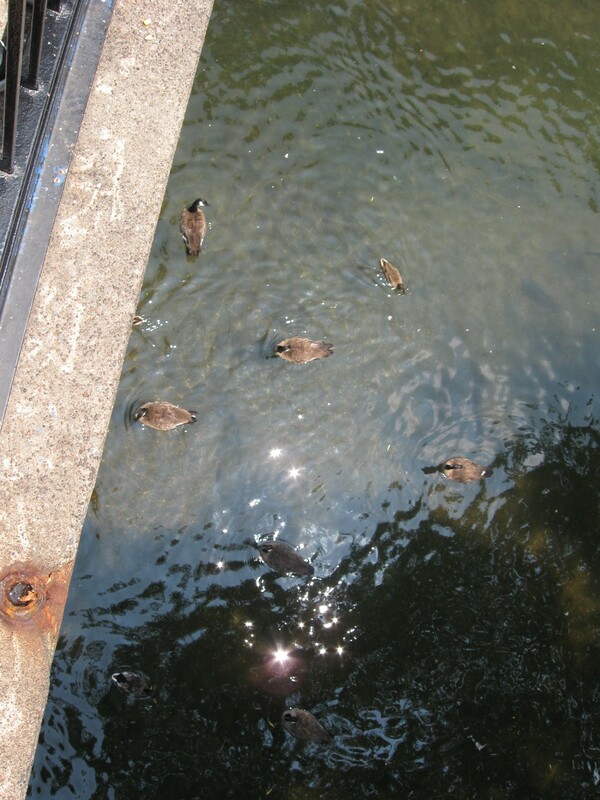 Wild ducks hanging out by the rides, probably fed more sugar per day than some kids in other countries see in a lifetime. Their concession stands allowed us to sample local restaurants not available in Indiana. I tried Famous Famiglia’s Pizza, which I think contained enough sodium to counteract the electrolyte drainage inflicted upon me by the bright, sunny day. Anne tried Nathan’s Famous Hot Dogs and was pleased with the results. My son stuck with Famous Subway and their Famous Sweet Onion Chicken Teriyaki sub because he had to be him. 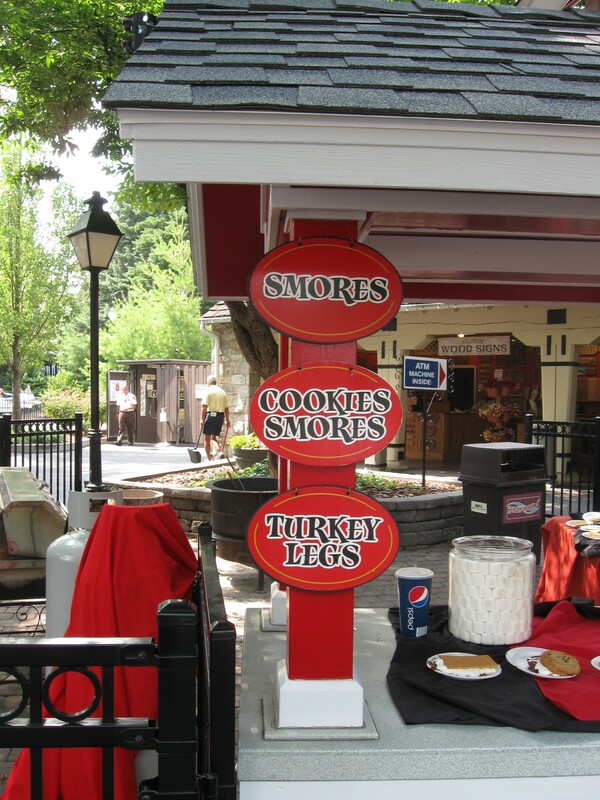 Besides, no matter how mediocre it might have been, we knew we would just supplement it with chocolate elsewhere in Hersheypark. 1. 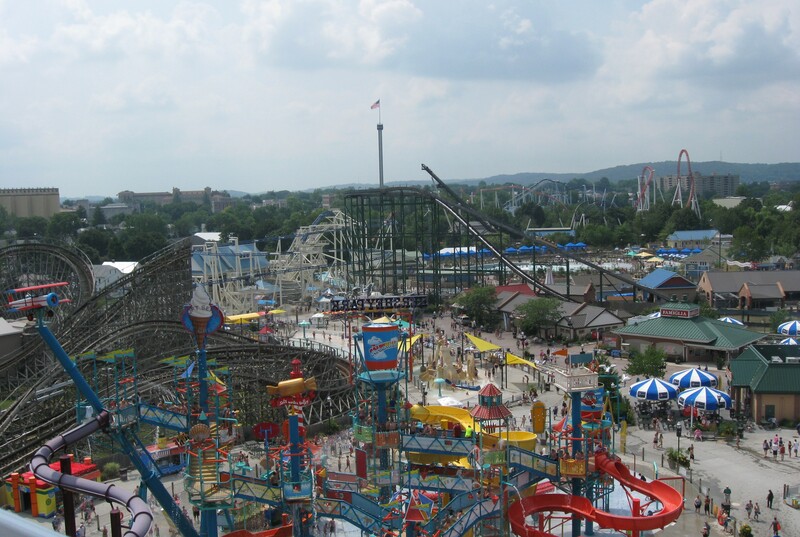 Every single Hersheypark ride mentioned in this chapter is still around and active today. Of all the amusement parks we’ve ever visited and recounted years later in hindsight on MCC, that’s a first. Most parks see some turnover as older, decaying rides are replaced with new. 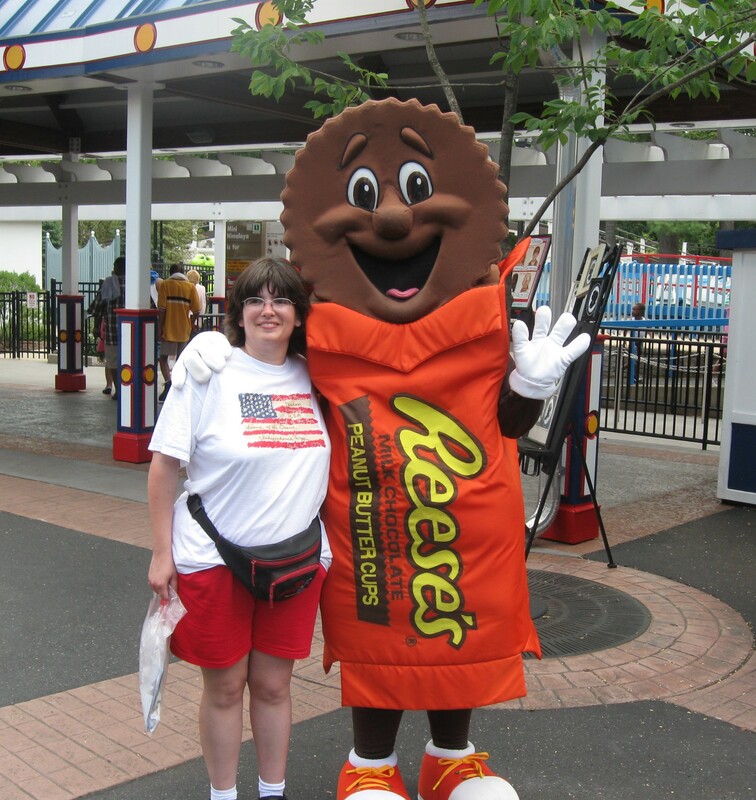 Hersheypark apparently takes care of their own. Ahh, the Wild Mouse. Scariest kiddy coaster of all time! It was fun to reminisce while reading over your account of the trip. So glad it worked out to meet up! Agreed! Still a favorite memory of ours.